To be able to mine in Outward you first need to get the Mining Pick as it is this tool which is used to dig ore to accquire raw materials for crafting new items. Keep in mind also when you use the Mining Pick to dig ore there is always the possiblity that you will find gems which you can then sell. The Mining Pick can be obtained at the very beginning of the game in the city of Cierzo once you have exited the Lighthouse. 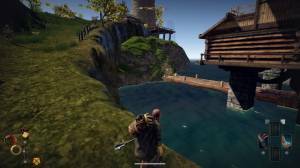 At this point in the game when you look towards the water you will see a long bridge leading to a wooden door (see screenshot above). When you enter through the wooden doors you will be at the Cierzo Storage site. At the initial part of this location there are no enemies lurking around so you can make your way along the road you find there without worrying about being attacked. After a while you will come across a dark cave which if you turn left into will enable you to find the Mining Pick which is inside. If you decide to go further into the cave and explore it you will eventually encounter several enemies so if you are new to the game it is advised that for the time being you do not venture too far into the cave. By just sticking to the illuminated parts of the cave you will be able to find several useful items including a Gaberry Jam recipe. To use the Mining Pick so you extract raw materials you must first find ore. Ores such as pieces of iron are scattered all over the world and can be found on the surface as well as dungeons. Once you have discovered ore you simply need to approach it and press the indicated button on your controller that is displayed on the screen. If your character has a Mining Pick in their inventory they will be able to extract the raw material. Check out our How to Craft Weapons page to see how you can use the ores you get from mining to craft weapons and armour.